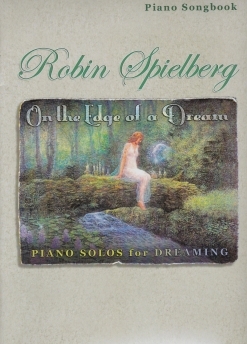 2018 / Spobs Music Inc.
On the Edge of a Dream is the companion songbook to Robin Spielberg’s 2018 recording by the same name. All fourteen original piano solos are included, transcribed note-for-note by Rebecca Oswald and proofed by myself, making this sheet music is as close to the recording as possible. Subtitled “Piano Solos for Dreaming,” the recording is intended for dreaming, contemplation, relaxation, and medical therapies. Because the original pieces are very slow and open, this sheet music is easier to learn than many of Robin’s other songbooks. That’s not to say that this book is recommended for beginners, but it is easier. Robin calls this music a celebration of “the nightly voyage from a state of consciousness to the edge of our dreams” so some of the pieces are very light and even playful while others are darker and more mysterious. I like all of the music in this book, but a few of my favorites are “Spellbound,” “Stargazing” and “Into the Night.” “Illusion” is played only on the black keys, which is fun! The book itself is in the 9”x12” format with a stapled binding. 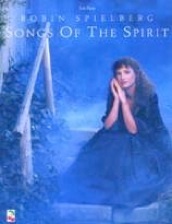 The cover artwork from the CD also graces the covers of the songbook. A really nice bio of Robin is in the back. The notation is well-spaced, roomy and very easy to read. There are very few chords on either hand, so there are no reaches of more than an octave. Metronome settings are included and expression is well-marked. Pedaling for this music is a bit more subjective, as Robin made wonderful use of the pedals to create a dreamy effect on the recording. Experienced pianists can probably duplicate the effect or get close to it, but less accomplished pianists would likely turn the music to mud by holding the pedals down too long. As a piano teacher, I plan to introduce my students to several of these pieces and know that they will really enjoy them. I can very confidently and enthusiastically suggest this book or the downloadable sheet music for teaching purposes as well as for your own enjoyment! 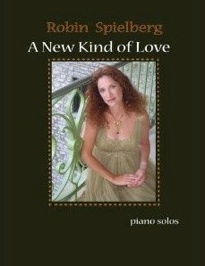 The book will be released on March 2, 2018 and will be available from www.RobinSpielberg.com and Amazon. Highly recommended!